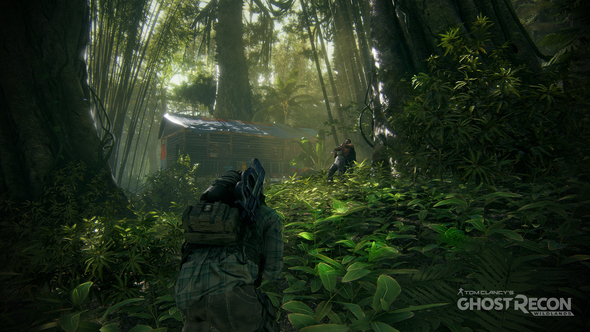 If you’ve played the recent Far Cry games, you’ll be familiar with the outposts peppered around their open-world maps. These enemy fortresses can be cleared out and approached however you want, using both stealth and aggression: you could ride an elephant in and wreck the place, sneak in and pick everyone off with silenced weapons and melee takedowns, trigger an all-out firefight, or even descend from the skies. 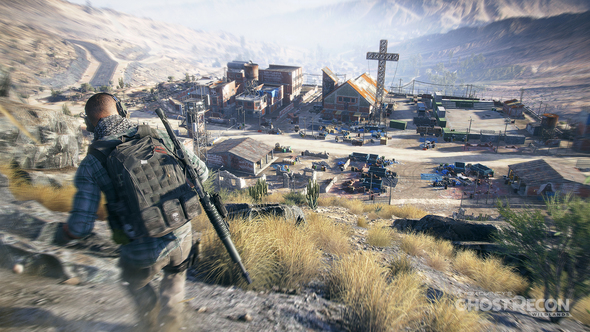 Ghost Recon Wildlands is a game built around these outposts – the best thing about Far Cry – though it takes a multiplayer focus. Want more upcoming PC games? We’ll see you right. 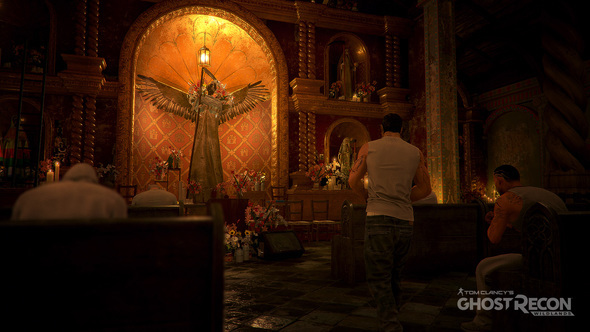 However, my hands-on with the game’s preview build kicks off in single-player, giving me command over three AI companions as we’re tasked with interrogating a lieutenant of Bolivia’s Santa Blanca drug cartel. The game begins with our customisable Ghosts standing atop a verge, giving me a proper look at the lush, mud-caked open-world, all abundant greenery and misty mountain peaks. As ever, this Ubisoft playground is absolutely the star of the show. Grabbing my bearded army lads and non-bearded lasses, I jump into a nearby 4×4 and start tearing down the mountainside mud tracks, occasionally nipping off-road – down sheer cliff faces – to get to my objective more quickly. Once there, I pull up, get out, and click the crouch button to enter stealth mode. After tagging enemy locations with the drone (you know the drill by now), instead of heading straight down the main path, I decide to stalk along the perimeter, bypassing the guards and heading to the far side, where the lieutenant stands waiting. It’s a sheer cliff face, but there’s a guard tower embedded into the rock, so I head up the stairs and choke out the sentry. The lieutenant is now in view, so I get up behind him and grab him, tapping the interrogation prompt and triggering a conversation. I’m being shot at mid-chat by other guards, but I manage to hold out until he tells me where I need to go. I press the prompt to cancel the conversation, releasing him so I can pop some heads and escape. Using the non-sticky cover system, I sidle up to a wall’s corner, but I’m facing the wrong way. In an attempt to figure out how to switch shoulders, I toss a grenade at myself and am forced to sprint into gunfire. Smooth. I work my way down the camp taking out the enemies – switching between first and third-person aiming – as I head back to my ride, when suddenly I feel a tap on my shoulder. It’s one of the developers telling me I need to interrogate the lieutenant – you know, the fella I just interrogated. Turns out you have to let the whole animation play out, even when he’s finished talking, or it doesn’t count, so I trot back and listen to the conversation all over again. Double smooth. If I were playing online with pals, I could have told one of them to grab him again while I get busy venting more heads. Hell, they could have covered me while the interrogation went down, meaning I wouldn’t have needed to even let go of the lieutenant in the first place. 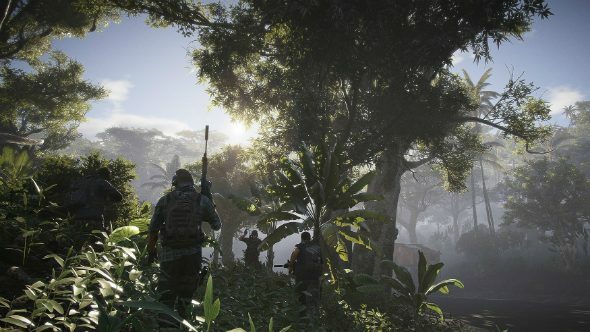 As a single-player game, Ghost Recon Wildlands feels is a little underwhelming currently, and a lot of that is down to your AI squadmates. You’re always the driver, the AI barely reacts to what you’re doing, they teleport around the map to keep up with you, and generally just stand around doing nothing unless you bring up the radial menu and give them specifics. Playing in single-player highlights the game’s limitations, basically. For example, shooting feels snappy and satisfying, but stealth is nowhere near as good as something like Metal Gear Solid V, another open-world military sandbox. The cover system almost always makes your avatar face the wrong way, forcing you to switch shoulders. Cars feel great, while bikes lack the nuances of something like GTA, with no weight shifting unless you’re pulling a wheelie. Helicopters, planes and parachuting all work fine, but you can’t help but long for a rudder in aerial vehicles. 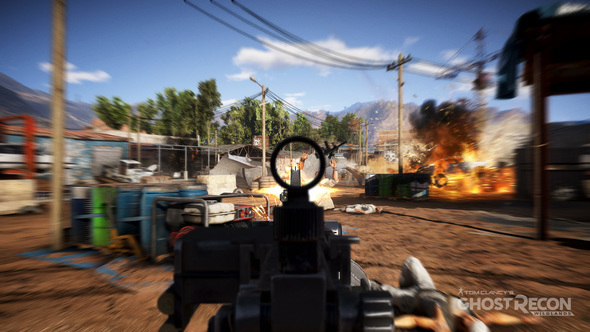 In online co-op, the game transforms. There’s something about timing four headshots with other humans that’s just far more satisfying than doing it with AI. 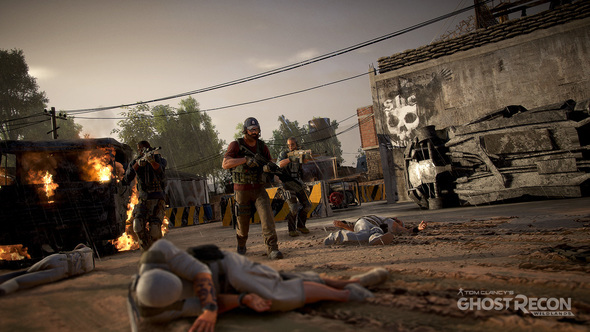 It’s because humans can miss – especially since Wildlands models ballistics, including bullet drop – so your perfect AI companions, who can teleport and are invisible when you’re sneaking, feel sterile. Like all sandbox games, Ghost Recon Wildlands is at its best when it’s unpredictable. During one online mission, we have to extract an important enemy soldier. We fail so many times. I call in a mortar strike on the target’s head, another player snipes him, he’s peppered with assault rifle fire… We try the same mission around ten times before I finally creep up on him and drag him to a helicopter before dicking off, leaving my pals to deal with the ensuing firefight. Triple smooth. I agree that this is one of the game’s strongest points. In one mission, my companions are spotting soldiers in a base, scanning it with their binoculars from a nearby mountain. I spot a tank, which could potentially be used against us if a firefight breaks out, so I tell my teammates to cover my approach as I make a beeline for it. By the time I’m climbing into the hatch, the base is on full alert, so I zip away, pick up an ally who’s running down the hill for the gunner seat and head back to decimate the base. It’s hard to imagine this exact scenario playing out in single-player, so I ask Couzian if he feels like the game isn’t meeting its full potential when playing solo. It’s a fair answer, as we shouldn’t expect the AI to live up to a real player, but this is clearly a different beast to something like The Division, which feels fine as a single-player game. Thanks to these AI squad members tagging along in Wildlands, it feels like you’re missing out when going it alone. There’s still a little time for Ubisoft to iron out some of the niggles with the preview build I played, but that fundamental issue will likely remain. Convince your friends to pick it up, though, and toppling Bolivia’s drug cartel will likely be an amazing anecdote generator. All the pieces are there, it just needs a bit more, erm, smoothing out.